Roulette has been beaten many times with effective methods that resulted to repeatable success.This article includeshelpful roulette tipsand information to keep you winning at the wheel. Exploit wheel bias – wheels may have slight anomalies or defects that result in their predictability or tendencies. Your role will be to explore these defects and make them work to your advantage. This was how Joseph Jagger “broke the bank in Monte Carlo” – he raked millions by studying physical defects in the manufacture of roulette wheels, the bias that these defects contributed to the behavior of the ball and the wheel, and the likely areas or numbers where the ball tended to land. Play the real roulette wheel – for long-term wins, opt for the physical wheel instead of random number generator, or RNG. You can have fun at the RNG, but will never gainfully win in the long term. Make the dealer’s signature work for you – casinos regularly vary the assignment of their staff especially the dealers because a signature or pattern may affect the predictability of how the ball is thrown and how far it bounces before it settles on a slot. Once you notice a pattern, use this to predict the likely sector or area where the ball may land and make a neighbor bet accordingly. Pick the European over the American wheel – of the two types of roulette wheel, the European (or single-zero) version gives the player a slightly increased chance of winning. It has 37 numbered slots, while the American version has 38 slots because of the additional “00”. With each straight bet (a bet on a single number), the player has 1/37 (or 2.7%) chance of a spin in a “0” wheel, compared to a lesser chance of 1/38 (or 2.63%) in a “00” wheel. Improve random chance – as mentioned, the probability of a number becoming the winning number in every spin is 1/37. This represents the player’s random chance of winning with that bet. Combined with the understanding of physics (hence, a more accurate prediction), the chance of winning becomes significantly increased and tips the chance in your favor. Understand the house edge – the casino has its built-in edge. This is not often clearly understood by bettors. If you bet on a number, it is understood that you have 1-in-37 chance of winning. If, at all, you win once in 37 spins, you will receive a payout of only 36 chips. In effect, you still would have lost by 1 chip even after winning 1 spin out of 37 spins. That 1 chip, computed as -0.027 (2.7%), is the expected value the player loses or the built-in edge of the casino for every bet made by a player. In the American wheel, the house edge is higher at -0.0526 (5.26%). Therefore, to sustain your bankroll, you have to win more than once in 37 spins and understand this concept to be able to develop systems that truly work. A player must possess the right frame of mind. Winning in the longer term is important. Avoid being detected by not being greedy. Discipline yourself by being satisfied with modest winnings. 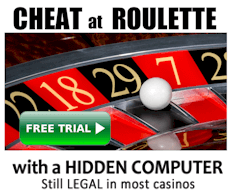 Casinos only have this goal – detect consistent winners and stop them from winning. Stop using effective roulette strategies that focus on betting systems or plans, such as “The Martingale”, “Labouchere System” and “D’Alembert System.” These strategies are not focused on predicting the winning number. Instead, they focus on the betting plan or progression of bets to recoup repeated losses. See why the martingale system loses. Avoid fallacies that will deplete your bankroll in no time. Don’t believe in streaks or that colors are due after the other color has appeared in a series. Going back to the principle of probability, the likelihood that a particular color will appear next remains to be 18/37 (or 48.6%) for every spin regardless of the color (or series of the same color) that preceded it. Every throw is independent of the other throws or events. To sum up, winning over casinos at the game of roulette involves predicting the winning number with the use of physics, reducing the casino’s edge, and changing the player’s odds in his or her favor.This is called the advantage play. With slight accuracy in your method of predicting the winning number, you sway the edge toward your direction. Strategies and systems that don’t give focus on these factors will only perpetuate fallacies that will never result to repeatable success. 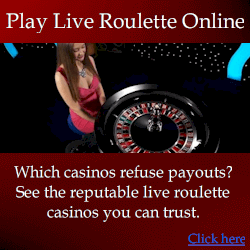 There are roulette systems that get banned because they win too much for casinos to tolerate, and they aren’t difficult to apply with time and dedication.